People cannot maintain their spiritual roots and their connections to the past if the physical world they live in does not also sustain these roots. Informal experiments in our communities have led us to believe that people agree, to an astonishing extent, about the sites which do embody people’s relation to the land and to the past. It seems, in other words, as though “the” sacred sites for an area exist as objective communal realities. If this is so, it is then of course essential that these specific sites be preserved and made important. Destruction of sites which have come part of the communal consciousness, in an agreed and widespread sense, must inevitably create gaping wounds in the communal body. Traditional societies have always recognized the importance of these sites. Mountains are marked as places of special pilgrimage; rivers and bridges become holy; a building or a tree, or rock or stone, takes on the power through which people can connect themselves to their own past. But modern society often ignores the psychological importance of these sites. They are bulldozed, developed, changed, for political and economic reasons, without regard for these simple but fundamental emotional matters; or they are simply ignored. We suggest the following two steps. 1. In any geographic area – large or small – ask a large number of people which sites and which places make them feel the most contact with the area; which sites stand most for the important values of the past, and which ones embody their connection to the land. Then insist that these sites be actively preserved. 2. Once the sites are chosen and preserved, embellish them in a way which intensifies their public meaning. We believe that the best way to intensify a site is through a progression of areas which people pass through as they approach the site. 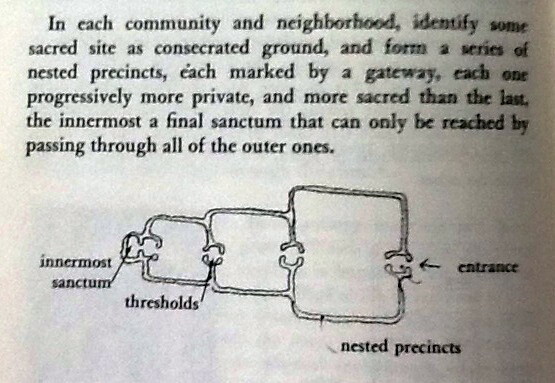 This is the principle of “nested precincts”…. A garden which can be reached only by passing through a series of outer gardens keeps its secrecy. A temple which can be reached only by passing through a sequence of approach courts is able to be a special thing in a man’s heart. The magnificence of a mountain peak is increased by the difficulty of reaching the upper valleys from which it can be seen; the beauty of a woman is intensified by the slowness of her unveiling; the great beauty of a river bank – its rushes, water rats, small fish, wild flowers – are violated by a too direct approach; even the ecology cannot stand up to the too direct approach – the thing will simply be devoured. We must therefore build around a sacred site a series of spaces which gradually intensity and converge on the site. The site itself becomes a kind of inner sanctum, at the core. And if the site is very large – a mountain – the same approach can be taken with special places from which it can be seen – an inner sanctum, reached past many levels, which is not the mountain, but a garden, say, from which the mountain can be seen in special beauty…Give every sacred site a place, or a sequence of places, where people can relax, enjoy themselves, and feel the presence of the place…And above all, shield the approach to the site, so that it can only be approached on foot, and through a series of gateways and thresholds which reveal it gradually. This entry was posted on	June 25, 2013 at 7:49 pm	and is filed under quote of the day. As an architect and designer I recognize the importance of transition from the outside world to the sanctuary that is one’s home (well, for many people at least.) This makes the first things encountered in a space very important. I have a couple of friends and clients that have made t;heir foyer, however modest, a reposeful, serene area of welcome. One always has fresh flowers and a small dish of uncooked rice on a beautiful walnut chest of drawers. On it stands a statue of the Buddha and on the wall mirror above hangs a scarf worn by the Dalai Lama. It is the vignette that sets the tone for the whole apartment. New York apartments don’t always have room for this sort of display, so the placement of altar items on a dresser in the bedroom allows us to create our own sacred spaces in our cramped quarters. My living room is watched over by a statue of Buddha that is often set off by fresh flowers and candles. It is a contestant reminder of my practice and helps me stay mindful despite the craziness I feel I may be facing. So I’m a strong proponent of the sacred, the serene and the beautiful in one’s home.